Alan Cranston served as U.S. Senator from California from 1968 through1993. He passed away on December 31, 2000. Toward the end of his life, he devoted himself to a world-wide effort to reduce, marginalize and ultimately abolish nuclear weapons. Toward that end, founded the Global Security Institute, serving as president of that organization and director of it's Nuclear Weapon Elimination Initiative. 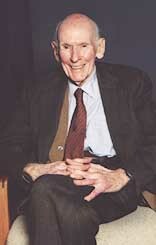 Cranston's service to world peace took many other forms as well: he travelled to Mongolia as an official U.S. monitor of the 1993 Presidential election (first in the history of that country) and was a delegate to a conference of world philosopher-statesmen convened by the Rajiv Gandhi Foundation in India. Cranston was dedicated to educating the public, and one of his last acts in this regard was his participation in the e-mail exchange with students from his alma mater, Lowell High School in San Francisco. The transcript of that exchange is linked below. For a full biography of former Senator Cranston, see the biography at the Global Security Institute.